Use a sturdy ladder to climb up safely to the roof top. Note that the tiles or shingles will become extremely slippery when wet thus it may be necessary to use a harness. Avoid slips and falls by wearing boots with non-skid soles. Tie garbage bags on all down spouts so that chemicals do not spill over the surrounding areas. Gather all of the tools that you need to successfully accomplish the job. In order to protect your eyes and hands from coming in contact with chemicals, wear protective goggles and heavy rubber gloves. If you need to prepare the cleaning solution yourself, do so in a large bucket and use a garden hose to spray it all over the surface. Make sure that the areas that look most dirty receive special attention. Be sure to rinse off the downspouts and the gutters in order to remove the corrosive cleaning solution from the metal. 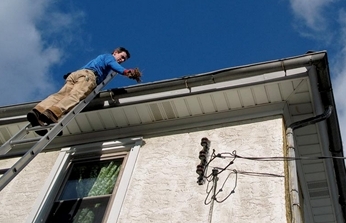 Clean up any loose debris that may have fallen off the roof. We recommend a magnetic sweeper to get the job done right. Remember, cleaning your own roof is a dangerous job. One mistake can cause an accident that may cost you your life. It is very important to use reliable tools not only to help get the job done correctly but also to ensure your safety. If you take the precautions above, you will significantly decrease yours odds of an accident happening. When it comes to roof cleaning and maintenance, safety should always come first! Good advice to rinse off the gutters to be sure not to forget any of the cleaning material when you're finished. Thanks for sharing.